I manage, with the same measure of denial that forced down Don Draper’s marauding self-hatred for the better part of his adult life, to forget again and again that he and Peggy are no longer on very good terms. So it all but guts me entirely to watch her face his return to Sterling Cooper & Partners with a vicious affirmation that she hasn’t missed him a bit. Sure, she’s in denial, too, blaming everyone else for her stunted personal and professional successes, as if Shirley in fact robbed Peggy of her reception of Valentine’s Day flowers, or Ginsberg of her well-deserved CLIO nomination. Don tops the list, representing to Peggy the architect who designed a glass ceiling so firmly unbreakable, never hesitating to tapdance atop in a gallant display of everything availed to those in the penthouse suite. But Don has fallen quite a few stories from his skyline view, desperate for everything from his L.A.-based wife’s sustained belief that he’s still gainfully employed to after-work visits from his ad hoc assistant Dawn Chambers. He swells in fierce agitation when both of these systems shatter this week, ostensibly losing that veneer of validity in the eyes of two more former secretaries: Dawn’s priorities lie with her actual boss now (to think!) and Megan is up-ended by the revelation that he’s been lying about his professional leave in order to keep from moving out to California to be with her. Adding to a list already occupied by Peggy, Allison, and let’s count Ida Blankenship (whose Mad Men Wiki page is written with quite the comically sardonic tone, by the way), and we’ve got a pretty poor track record for Don re: the long line of mistresses/daughter figures he kept at his front desk. With the last pieces of his old life lost after the shifts in his relationships with Dawn and Megan, Don has no other choice but to move on… back to his old life, that is. And so we’re treated to a sequence as surreal as Roger’s LSD trips, as viscerally disconcerting as anything involving Glen Bishop: Don’s trip back to the office. Passing over an an offer at a rival firm that would have beckoned him as a royal ambassador, Don instead shows up unannounced at Roger’s apartment, barking rhetorical questions about friendship and loyalty. Roger, seizing the opportunity to reupholster his shrinking office team, tells Don to show up the next morning… something that, upon arrival, Don realizes nobody else in power has been briefed on. 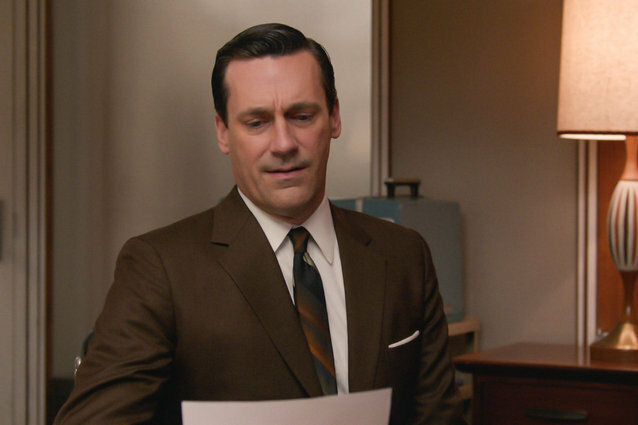 Intercutting scenes of Don’s stimulating professional ascension/degradation is a far weaker storyline, if only for that we’ve seen it so many times before: Betty Draper, making her first appearance in Season 7, rehashing the same old Betty Draper story. Prompted by her scorn of an impressive working mother, old fashioned Betty accompanies Bobby on a field trip to a local farm, spending her time boosting her own self-image with vacant conversations about the Wolfman and Dracula, sips of fresh-from-the-cow milk, and quips about the revealing dress of the farmer’s daughter. But one foul-up by doe-eyed Bobby (who trades her sandwich away because he “didn’t know she was going to eat” — that should tell us something about Betty’s post-weight loss dietary habits) is enough to remind Betty that she really can’t stand her kids. Having seen the same territory tread with January Jones’ character since Season 1, in which she treats everyone in her life to a cold hostility and victimizies herself all the while, we should expect this final season to treat us to something knew, or at least conclusive. But her misanthropy is in its usual form, her self-pity is operating at normal speeds… her trip to the farm gives us nothing new in the Betty department. Thankfully, we have gold in the Don department this week, especially in his reunion with Peggy’s in the penultimate scene of episode. She waits the duration of “Field Trip” to catch the anxious Don alone in the break room in order to deliver her unforgiving salutation, which bites like the dickens: “I can’t say that we’ve missed you.” But in terrific form, the unsolicited jab finds itself sandwiched between two instances of much greater mutual favor for the longtime colleagues. With Don’s barely shielded pain, we rush immediately back to his soft-eyed kissing of her hand at the close of Season 5, the moment he was forced to acknowledge that his daytime daughter figure was graduating beyond his hold. The second moment illicited by Ms. Olson’s harsh proclamation is one that we haven’t seen yet: the ultimate reunion — be it charged by a newly leveled playing field for the pair, a joint derision of the powers that be, a refurbished drive to make something of value of themselves, or just your plain old realization that they might be all each other has — of Don and Peggy, and their good graces. In her insistence in assuring Don just how little he means to her, Peggy shows us just how much he does. And in the childlike wince he can’t work hard enough to mask, he returns that favor. So now it’s only a matter of time.